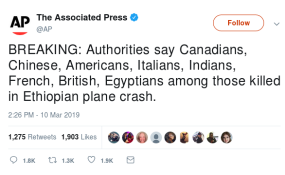 The Associated Press tweet about the Ethiopian Airlines plane crash. As news on the crashed Ethiopian Airlines plane trickled in, social media users shared photos of what they perceived to be the plane and the crash scene of flight ET 302. Here are some fake images that went viral on Sunday and part of Monday. This image of a crashed plane is in fact an Ethiopian Airlines Cargo craft, which came down on January 10, 2015. The Boeing 737-400 had three crew members on-board when it dropped to the ground during landing at Accra-Kotoka Airport in Ghana. The fake image was widely shared on social media in relation to the Flight ET302 crash. This image was also widely shared both on Twitter and Facebook, perceived to be that of Flight ET302. The truth is that it is that of an Algerian military plane, which crashed in April 11, 2018. A total of 257 people were killed in the disaster that rocked the outskirts of the capital Algiers. And this photo, also widely shared across social media in relation to Flight 302, is actually an Indonesian military C-130 Hercules craft, which came down into a residential area in the North Sumatra city of Medan, Indonesia, on June 30, 2015. Another image widely shared by social media users in relation to the Ethiopian tragedy is this one. The true position is that the plane belongs to Asiana Airlines (Flight 214). The plane crashed after hitting a seawall while landing at San Francisco airport on July 6, 2013. Three people were killed and nearly 200 others injured. The Ethiopia Airlines Flight ET302 crashed at Bishoftu in Ethiopia on its way to Nairobi, Kenya, killing all the 157 people onboard. South Sudan: Will Pope Francis' Kiss Bring Lasting Peace to South Sudan? Kenya: Did Gor Mahia Official Pocket 'Commission' From Sonko's Bailout Cash?